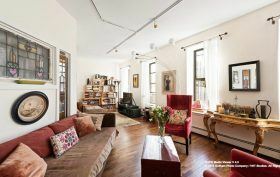 Rocker Peter Gabriel’s daughter, Anna Gabriel, is unloading her East Village pad for $1.65 million. Gabriel, who has shot music videos that include notably Beyonce’s “Countdown” and “Sweet Dreams,” purchased the apartment at 303 East 8th Street in 2006 for $1.05 million, according to public records. (You can see some photos of her living space here.) Now the two-bedroom unit–which boasts 17 windows across four exposures–is looking to find a new owner.